Sam Betten – who returns to the country’s triathlon capital Subic to lead participants in the 1.5k swim, 40k bike, 10k run Black Arrow Express 5150 race on November 4 – has been very successful competing in the Olympic distance triathlon. It’s a distance he prefers because it allows him to go all out at every stage of the race. “I have had two 5150 wins so far this year and really love racing over this distance. It is very different to a 70.3 or IRONMAN in the sense that in a 5150 you go as hard as you can for the entire race,” Betten said. The 6-foot-4 Aussie is gunning for a fourth consecutive 5150 championship in the Philippines after completing a three-peat last year. “I have really enjoyed the hard and fast racing over the 5150 distance in the Philippines and it has been really great to have had so much success. Being that I have been racing this distance for so long I have so much experience which really allows me to make the most of the opportunity to succeed on race day,” Betten said. Experience has taught Betten valuable lessons especially on how hard he can push his body for optimum results. “I have been racing 5150 triathlons for about 15 years and because of this I am a lot more experienced over this race distance compared to 70.3 which I have only been racing for about six years. I really enjoy the faster racing of the 5150 triathlon events,” Betten said. Betten’s biggest challenge will come from fellow Aussie Mitch Robins, Jakub Langhammer of the Czech Republic and American Tim Linn. Triathletes from 21 countries will compete in the event. They include seven from Australia, six from Great Britain, five from the US and four from Japan. Three from France and Hong Kong are participating in the event which also drew competitors from Belgium, Canada, Denmark, Guam, Guatemala, India, Italy, New Zealand, Malaysia, Norway, Russia, Portugal and Vietnam. 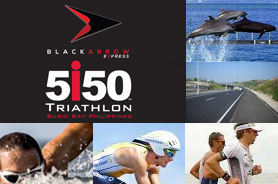 “Subic Bay is one of my favorite places in the world to race in. For me, this is a great triathlon location,” Betten said. Betten loves the distance, he will race on a course he’s very familiar with and will no doubt be the favorite in an elite field vying for the inaugural Black Arrow Express 5150 crown. Subic Bay and ACEA Subic Bay are the hosts of the event. Major sponsors are David’s Salon, Pioneer Insurance and Wicked Active Gear. The race will be Sunrise Events’ final triathlon on its milestone 10th year of staging the premier endurance race in the country. Backing the event are TYR (official swim cap), GU (official energy gel), Active Network (official registration partner), marketing partners Alaska, AlcoPlus, Cetaphil, DeVant, Nuun, PLDT Subictel, Smart, Sanicare, Regent, Storck and Timex and media partners Hyper HD, Cignal, The Philippine Star, AsiaTri.com and Finisher Pix.